Inspired by global travel and the bold, colourful motifs adorning fashionable ski chalets, Safavieh translates rustic lodge style into the supremely chic and easy-care Adirondack collection. Crafted of enhanced polypropylene yarns, Adirondack rugs explore stylish over-dye and antiqued looks, making striking fashion statements in any room. This collection is power loomed in Turkey. This is a great addition to your home whether in the country side or busy city. The contemporary look of this Safavieh Adirondack area rug adds style to any room. Decor done right with this indoor piece, and its plush polypropylene material. Modern style and construction is combined in this machine-made rug. Quality comes first in this geometric patterned silver rug. Improve the overall interior design of your living room, dining room, or hallway with this Safavieh Adirondack area rug. Decorate the right way with this indoor piece constructed from plush polypropylene material. This rug is comfy, machine-made, and stylish. Maintain your modern home aesthetic with this geometric patterned silver rug. Place this Safavieh Adirondack area rug in your dining room when you need a splash of style. This indoor piece is made from plush polypropylene material, which is high quality and high fashion. 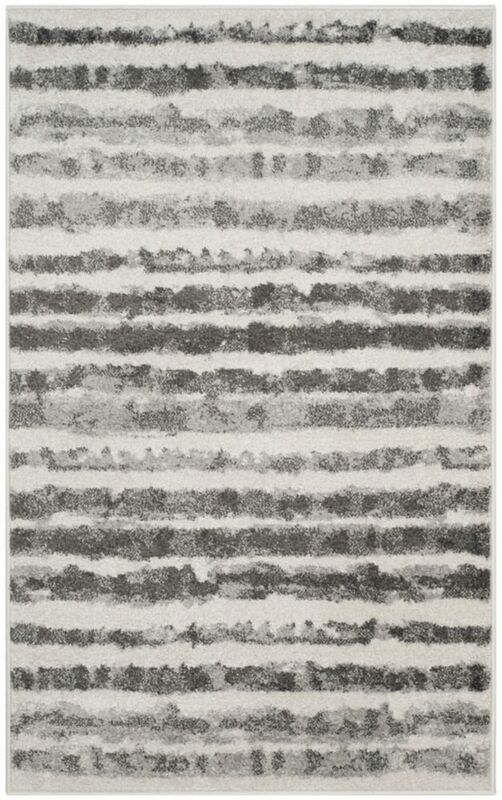 The machine-made construction of this area rug is both modern and comfortable. This geometric patterned silver rug makes a contemporary mark on your home's interior design. Inspired by global travel and the bold, colorful motifs adorning fashionable ski chalets, Safavieh translates rustic lodge style into the supremely chic and easy-care Adirondack collection. Crafted of enhanced polypropylene yarns, Adirondack rugs explore stylish over-dye and antiqued looks, making striking fashion statements in any room. This collection is power loomed in Turkey. This is a great addition to your home whether in the country side or busy city. Adirondack Callista Ivory / Charcoal 3 ft. x 5 ft. Indoor Area Rug Inspired by global travel and the bold, colourful motifs adorning fashionable ski chalets, Safavieh translates rustic lodge style into the supremely chic and easy-care Adirondack collection. Crafted of enhanced polypropylene yarns, Adirondack rugs explore stylish over-dye and antiqued looks, making striking fashion statements in any room. This collection is power loomed in Turkey. This is a great addition to your home whether in the country side or busy city.